Heading back to Chicago in the mid 90’s we find ourselves with Laurence ‘L.A.’ Williams, a respected producer in his own right, however most well known for his brief involvement in seminal acid house collective Phuture (later renamed Phuture 303). Phuture formed in the mid 80’s with members DJ Pierre, Earl ‘Spanky’ Smith Jr & Herb J. They released their first EP in 1987 on Trax Records which included a track initially called ‘In My Mind’, later to be renamed ‘Acid Tracks’. Marshall Jefferson lent a hand in producing ‘Acid Tracks’ and upon hearing the initial recording, told Phuture to “slow it down from 125 – 120bpm… it’s too fast & New York won’t accept it”. Pierre & Spanky gave Ron Hardy a demo tape of Acid Tracks, which he played at his club ‘Music Box’. Club patrons thought this was an original track by Hardy, as Phuture were unknown at the time, which led to track being referred to as “Ron Hardy’s Acid Track”. Williams joined the group in ’96 & by that stage they had renamed themselves ‘Phuture 303’, however that’s getting ahead of ourselves. In ’92 Williams first EP ‘Move Your Body’, on label Stricly Rhythm, was co-produced with DJ Pierre under the alias ‘Chicago Syndicate’. 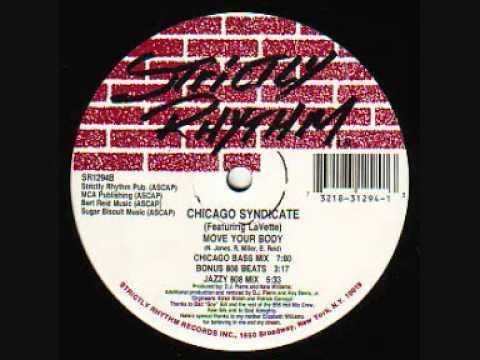 Like many multi-moniker producers at the time, Chicago Syndicate only ever released one EP. In ’95 Williams released six EP’s under L.A. Williams; The Project Part I & II, Short of Breath, Put Me in a Groove, The Straight Jacket EP & Terminal Velocity. ‘Put Me in a Groove’ EP was released on Relief Records, one of three Cajual Records sub-labels run by Curtis Alan Jones; better known as Green Velvet. Phuture returned to the scene with their first full length album ‘Alpha & Omega’ followed by the ‘Phreedom’ EP, both of which Williams was involved with until his departure later that year. Williams continued pushing out releases under his name & other projects; Group X & Party Bus People, throughout the late ’90s until he took a short break at the turn of the millennium. Williams is now working on his own label, ‘The Last Souls of Techno’.